For days when you want to get away from the hustle-bustle of the city life, Parvati Hill is a perfect getaway for a great day trip. The beautiful hillock is not too far from the city, but enough to give your mind and body some breathing room! And the walk uphill is handsomely rewarded with a bird’s eye view of the city. Parvati hill is located on the southern side of the city. It’s within city limits and should take you an average 45 minutes to an hour even from the further ends of the city. Once you get to Saras baug, Sahkarnagar or Swargate, it’s about 2.5km-3km (based on where you are exactly) and it’s a good idea to take a rickshaw from any of these places to the base of the hill, rather than take your vehicle along, because parking can be a hassle. Once you’ve reached the base, getting to the hilltop is a 103-step climb and should take you an approximate 15-20 minutes. The steps are about four to five feet apart so it feels like a mini-trek. And once you get to the top, a memorable panorama of the city will mesmerize you and calm any heaving breaths. 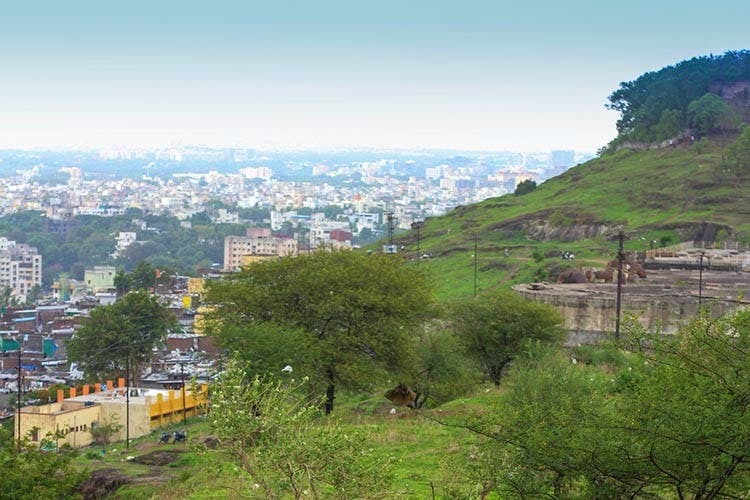 It’s the highest point in Pune perched at a graceful 2100ft. and offers a view of the city that’s just as breathtaking in the morning fog as it is when laced by the lights that come on in the evening. It is home to 5 of the city’s oldest temples (Devdeveshwar Temple, Vishnu Temple, Kartikeya Temple, Shri Vitthal Temple, Ramana Temple) among which the Devdeveshwar temple is one you should not miss. But apart from religious piety, the Parvati hill is steeped in history as a relic of the honorable Peshwa Dynasty. There is Peshwa museum atop the hill which houses replicas of old manuscripts as well as paintings. It is a commemoration of the Peshwa rule and has a collection of portraits of the Peshwa rulers. It is also shrine of Shrimant Nanasaheb Peshwa. The hill is open to visitors on all days of the week between 8am and 5pm but it can get a tad bit crowded on the weekends and public holidays. There isn’t an entry fees to the hill itself, but the museum entry is INR15 per head. The weekend is almost here, and this is a pretty great plan for a day trip, so head on out and get your weekly dose of adrenaline!